Starbucks BOGO Holiday Drinks are back! 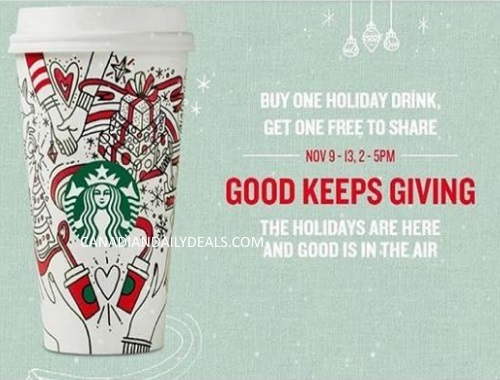 When you buy a holiday drink you can get 1 Free! Offer is valid November 9-13, 2017 2-5pm. Starbucks Rewards members probably get another hour, I didn't notice on the sign. Look out for their holiday sticker cards too! Buy any five grande beverages from November 9-January 8 and collect five stickers to receive one Free grande espresso beverage of your choice. Free beverage expires January 8, 2018.